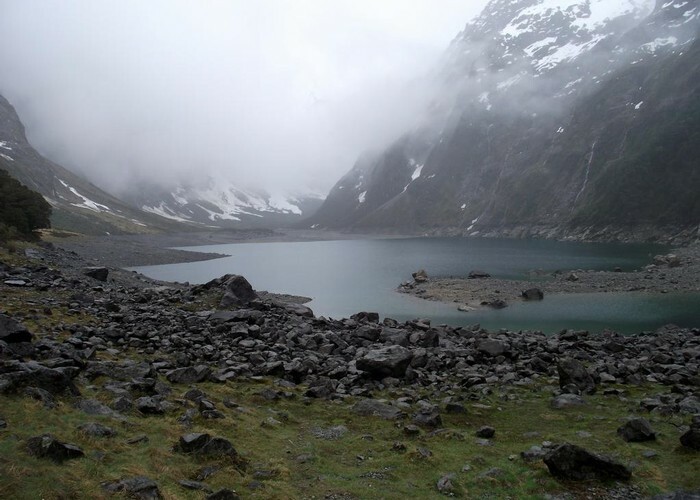 Short walk from the Hollyford Road up to a hanging valley and lake in the Darran Mountains. Lake Marian • By Yarmoss. Licence: C.
Lake Marian car park, Lower Hollyford Road, off SH94. From the car park, cross a swing bridge and follow a track through beech forest alongside Marian Creek. A wooden gantry edges along the bank of the creek, affording good views of the tumbling water. From here, the track climbs through forest to the lake, situated in a hanging valley above the bushline. Added 6 January 2011 by MatthewMatthew. 1 revision 6 January 2011 by MatthewMatthew.